Wild Blueberries are harvested commercially only in Canada and Maine. Many of today’s independent, family-owned growers have been in the Wild Blueberry business for generations. In fact, the oldest commercial processing company dates back to 1874. Wild Blueberries (vaccinium angustifolium) are wild by nature, and can’t be planted or farmed in the ways that many industrial food crops are. Unlike ordinary blueberries, Wild Blueberries are spread primarily by rhizomes (underground runners), which give rise to new roots and stems. All shoots arising from the same rhizome system have similar characteristics and are referred to as a blueberry clone. Unlike regular blueberries, Wild Blueberries only grow wild, where mother nature put them. 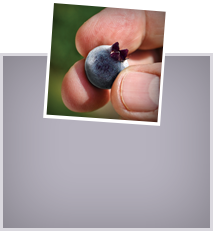 Wild Blueberry fields and barrens actually produce many different lowbush blueberry clones, which account for the variations in color, size and flavor that characterize the Wild Blueberry crop. This rich diversity also creates a potent combination of phytochemicals that gives the Wild Blueberry its antioxidant power. Naturally suited to acidic, low-fertility soils and cold, harsh winters, Wild Blueberries are a low-input crop requiring minimal management. The berries are grown on a two-year cycle. Each year, half of a grower’s land is managed to encourage vegetative growth and the other half is prepared for harvest. In May, growers import a billion commercial bees to aid the native bee population in pollinating the barrens and fields. There are many bee species associated with Wild Blueberries, including bumblebees and honeybees. Native bees are exceptional pollinators and Wild Blueberry growers take care to preserve wild bees through conservation practices. After the harvest, which begins in late July and continues through August, the plants are pruned to the ground by mowing or burning. Many Wild Blueberry crops are still harvested the traditional way, using hand-held berry rakes that were first invented in 1910. Whether hand raked or machine harvested, Wild Blueberries are sorted, cleaned and processed within hours of being picked, using state of the art technology. Growers use winnowing machines in the fields to remove leaves and twigs before the berries are washed and frozen. Wild Blueberries are individually quick frozen (IQF) using a method that allows for the fast preservation of taste and nutrition for millions of berries. IQF berries can remain frozen for over two years without losing their flavor or nutritional value. Laser color sorters are also utilized to remove anything but the finest quality Wild Blueberries prior to packing. Wild Blueberry growers are strongly committed to best agricultural practices. They use sustainable management techniques to ensure healthy crops and to protect Wild Blueberry lands for future generations. Because Wild Blueberries are indigenous to Canada and Maine, they are naturally resistant to many native pests. Still, growers are challenged to minimize crop damage caused by environmental stressors such as disease, drought, insect damage and winter injury. Using Integrated Crop Management (ICM) and Integrated Pest Management (IPM) throughout the crop cycle, growers monitor disease and insect levels to minimize fruit destruction without harming the environment. Around the world, demand for Wild Blueberries has skyrocketed thanks to growing awareness of the health benefits inherent in Nature’s Antioxidant SuperFruit. Canada is the world’s largest producer of “lowbush blueberries,” which is another name for wild blueberries. Most are grown commercially in Quebec and the Atlantic provinces. In 2016, wild blueberry production was up 41.2% to 132,235 tonnes. In Maine alone, where over 37,000 tonnes of Wild Blueberries are produced each year, the crop has a market value of more than $250 million annually. Clearly, Wild Blueberries make a major contribution to the economies of Canada and Maine, the Land of Wild Blueberries.